Give the gift of healthy skin! An ideal opportunity to gift your Loved one some skin care goodies, L'Oreal Paris introduces their effective skin care gift set that includes the refreshing L'Oreal Men Expert White Activ Oil Control foaming face wash and scrub combo that enhances the complexion, keeping it looking visibly healthy and bright.The L'Oreal Men Expert Grooming Essentials Gift Set is available at Nykaa at just Rs. 999! The L'Oreal Men Expert White Activ Oil Control Charcoal Brightening Foam cleanses and removes impurities to give you visibly brightened skin. The formula helps fight the five forms of aggression caused by shiny skin, blackheads, oily skin, dull complexion and large pores.Enriched with ADS Active Defense System which is a powerful soothing active ingredient, that helps to reinforce the skin's natural resistance against daily aggressions for less tightness and more comfort. Infused with ingredients like Pro Exfoliatine, a powerful peeling agent which smoothes irregularities on your skin surface and helps stimulate natural desquamation. Anti shine: Like a magnet the formula captures and washes oil and dirt for fresher and matte skin for long. Anti dullness: It purifies skin impurities and dull dead cells for bright and healthy look. Anti spots: The formula fights pimples, reduces blackheads and dilated pores. The black scrub combines the magnetic power of Charcoal with 2000 beads to dive deeply into pores and unclogs them one by one. It effectively removes oil, dirt, dead cells and other forms of impurities from the skin's surface and deep in the pores. It visibly reduces blackheads and other imperfections caused by blocked pores with impurities. Visibly reduces blackheads and other imperfections caused by blocked pores with impurities. Removes excess oil, impurities, dirt and grime from skin.It unclogs pores and deeply purifies skin. Combines the magnetic power of charcoal with two thousand beads. The products come along with an exclusive grooming travel pouch making it an ideal gifting option and works as a handy travelling kit as well. Explore the entire range of Gift Sets available on Nykaa. 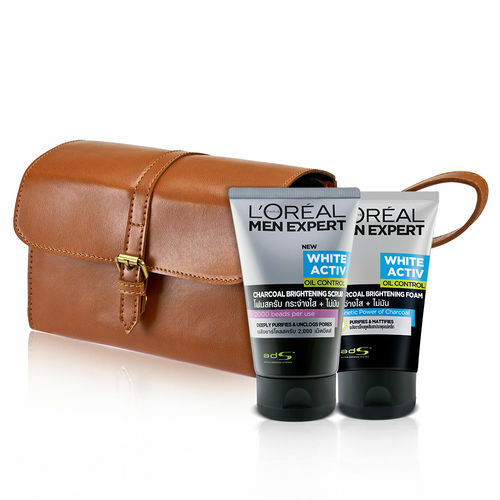 Shop more L'Oreal Paris Men products here.You can browse through the complete world of L'Oreal Paris Men Gift Sets .